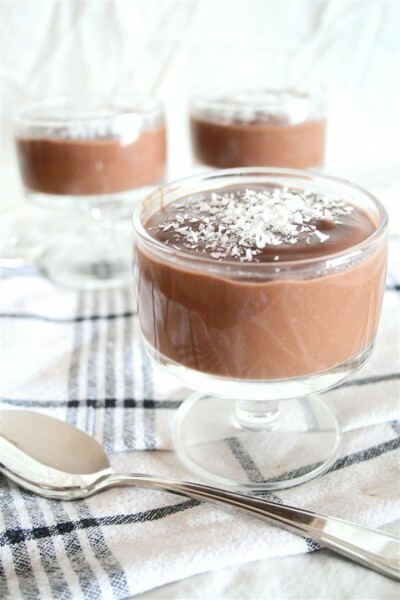 Vegan Chocolate Coconut Pudding was posted on February 18th, 2011 and is filed under Dairy Free, Desserts, Kid Friendly, Recipes, Vegan. This entry has 19 comments. You can follow any responses through the RSS 2.0 Comment Feed. The other day we had a big, family dinner and my contribution was dessert. My brother, sister-in-law, and their children stay away from gluten, and my Dad can’t eat gluten or dairy, and then there’s me, who doesn’t really eat much dairy either. I felt like being creative and making something up, but I wasn’t quite sure about doing a dessert for the whole family and then discovering it didn’t turn out. Thinking about it, I unquestionably wanted to make a dessert with chocolate (duh) and coconut. I decided to brave it without a recipe and make a dairy-free, cooked pudding…with a twist. This is a slightly firmer pudding and I think it tastes best when just warm, but is still delicious if you let it set on the counter, or in the fridge for an hour. It all depends if you like hot or cold puddings. Some of my family topped it off with something slightly sinful; ice-cream or a whipped topping. I tried to make this recipe as healthy as possible, but ended up adding just one naughty ingredient…1/2 cup sugar. But since this recipe serves 8 people, it doesn’t end up being that much sugar per person. Heat up the first 5 ingredients until boiling. Let it boil for 1-3 minutes. By then, it should be thick. Stir in the vanilla and sea salt. Pour into 8 dessert bowls. Garnish with a sprinkling of shaved coconut. That’s it! I love this recipe because it’s so quick to whip up, tastes so creamy and chocolaty, it’s a lot healthier than store-bought puddings, and serves lots of people. Enjoy! This is an awesome coconut pudding…loved the combo and am sure it tastes divine, need to give it a try soon ! I just made this. I found it on foodgawker. I used soy milk (made from soy milk powder and water) and left out the salt. Thanks for the super recipe! fantastic! my kids are always asking me to make them pudding (but it needs to be dairy free). Thanks for this yummy recipe! Cant wait to try it!!! Yum! This is totally up my alley. I don’t eat corn, but I bet I could replace it for potato starch instead. Your pictures are so beautiful! This looks fantastic. I love your beautiful photos! I just wanted to let you know I’m featuring your recipe today on my weekly features. Thanks so much for sharing it! Shut UP! This is sooo right up my alley, love chocolate & coconut – the recipe looks delicious! Your photo is beautiful as well. Thanks SO much guys! So happy you enjoyed it! It’s one of my favourites right now too! Could you use something else instead of white sugar? Amanda~ I haven’t tried it with anything else, so I can’t give you a “for sure” substitute, but I’m very certain you could use coconut sugar (same texture, low GI, very good for you). Sarah~ I appreciate your concern and thank you so much for mentioning it to them. It is a cool site and I love the idea behind it, so I’m all for supporting it with my posts. Thanks so much! My first visit to your lovely blog and great recipes (clicked over from Kelly’s, Eat Yourself Skinny). I’ve been noticing more recipes using coconut, these days. I will definitely check out the AROY-D coconut milk. 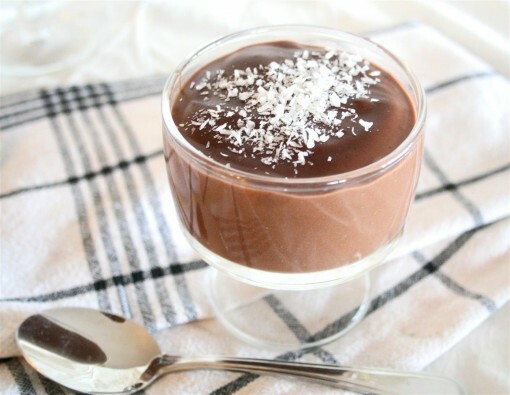 On this recipe for chocolate coconut pudding for 8 people, about how much is that per serving, meaning serving size per person? I love how you’ve presented it in the little dessert dishes. Where to find that cute dish & size?